The video you’re about to see is a bit of an optical illusion of sorts. 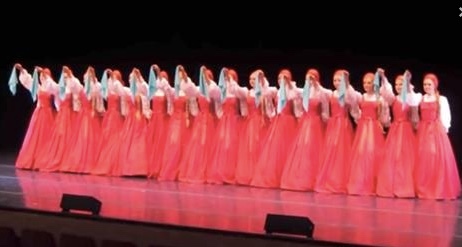 There are 16 women that appear to be floating or gliding as if on roller skates. The truth is, they are just incredibly graceful dancers. Berezka Ensemble, also known as the Little Birch Tree Choreographic group, danced a routine that was choreographed by Nadezhda Nadezhdina. It’s a type of dance that is surely going to take your breath away. The technique of dance was developed in 1948 and has been blowing minds ever since. This dance group has clearly become a group of professionals when it comes to this style. They look like they’re floating on air! Continue to the next page to see their surprising dance routine on the next page. Be careful though, you might end up down a rabbit hole of looking up “floating step” dance routines!